Here is Trump's comment on the bombing. Rather mild one would think. Oh, hell no, as Mark Dice makes clear. I even saw where one guy wondered that given Trump's quick response that it was a bomb showed he had prior knowledge! This election the Liberals are going completely cuckoo. Trump's big sin was making the bomb call before Hillary did. Like my late Hubs used to say, "You snooze, you lose." BTW, Hillary looked like someone roused her from a sound sleep. No wonder #ZombieHillary is trending on Twitter. I find it interesting that progressives / statists bow so much to authority they can't call a bomb a bomb until given the okay by the PTB. Early on in the behavioral science world of psychology, the stupidity was in full array as they sought to prove the most obvious and inane truths. 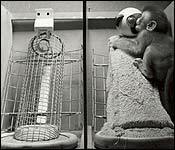 It resulted in making this psychologist famous; Harry Harlow. Here is what he "proved" so the world of behavior science could move forward. Baby monkeys would prefer fake mothers covered with terry cloth fabric. DUH!!!!! Would you leave the baby monkeys alone? The experiment was heralded! Breakthrough material!!! It proved to us ordinary folk, how stupid you are Mr. Harlow! "They college educated folk don't know nawth'n!" as my childhood farmer friend Charlie used to say. Sadly these folk are still around and they've been propagating their stupidity all over the place. It's gotten so we don't know nawth'n for sure anymore.